As with many other frontiers, the Bengal renaissance flowered mellifluously in the domain of music as well. An exhaustive account of this creative flowering would of course require the space of several books, suffice it to say that the overarching contributor to this renaissance was none other than the greatest symbol of the renaissance, the poet-philosopher Rabindranath Tagore. Tagore’s music, manifested through his multi-hued lyrical writing (via Gitanjali, Gitimalya and many other verse collections, as well as created specifically as vehicles incorporated within his many dance dramas which channeled the classical age back into the modern age), has been and continues to be of immeasurable influence and value to Bengali cultural life, and holds out the promise of becoming equally influential outside the domain of Bengal. Alongside Tagore, and almost contemporaneously with him, several other creative figures appeared in Bengal within the last quarter of the nineteenth century, and they left their imprint upon the musical revolution which continues to reverberate to this day throughout Bengal. Among them, mention must be made at the very least of Dwijendralal Roy, whose DwijendraGitibegan with inspiring paeans to the history and glory of India, but developed much more organically into songs of devotion and varying emotions; Rajanikanta Sen, whose RajanikanterGaan were primarily of a deeply (non-denominational) devotional nature (building on ideas with roots in Bengal’s longstanding history of devotional music, especially those to the goddesses Kali and Durga, and also kirtans devoted to Krishna and Radha, influenced in no small part by the revival of the Vaishnava movement by Sri Chaitanya Mahaprabhu); Atulprasad Sen, a Bengali expatriate in Lucknow who, much like Dwijendralal, also composed many soul-stirring songs of love for the motherland, but developed further into a composer of songs exploring romance and human emotions; and, perhaps closest to Tagore in terms of overall influence, there was KaziNazrul Islam, who composed not only stirring songs of protest and rebellion against colonial oppression, but also experimented extensively with melodies, incorporated languages borrowed from Arabic, Farsi and Urdu, and created a genre uniquely his own (as did the three others mentioned earlier). In the post-Tagorean era, running approximately from the 1930s onwards, there occurred a number of innovative and sometimes path-breaking musical movements, including many in the instrumental domain (sometimes including interesting intermingling of instrumentals and vocals with avantegarde dance forms, such as the modern interpretations of classical and mythological themes ushered in by the virtuoso Uday Shankar and his precocious younger brother, Ravi). There were also strong performers of raga-based vocals along the lines of thumris, khayals, dadra and ghazals ushering in a sense of classical continuity with new influences and interpretations. As the 1930s and ‘40s rolled around, what later came to be known as the golden era of post-Tagorean musical epoch began to take shape. Many a name stands out as a marker of this epoch, not the least being Pankaj Kumar Mullick, JaganmoyMitra, Sudhirlal Chakraborty, and of course such modern pioneers as Salil Chowdhury and HemantaMukhopadhyay. While this list is highly incomplete and at most touches the tip of the musical iceberg, each of those listed (and a great many not listed) carried modern Bengali music in a variety of innovative directions, including incorporation into the world of cinema and theater, fusion of Eastern and Western traditions, as well for the purpose of social upliftment. From a slightly earlier segment of this epoch, one musician and composer, rising out of an aristocratic and royal lineage, created a style of Bengali music which was almost entirely rooted in the rural and folk traditions of Bengal, and yet left an indelible imprint upon it which remains unalterably his own. Near the mid-point of his spectacular career, Sachin Dev Burman (SDB) carried his creative talents over to the domain of film centered in Bombay, and even though the one flaw in that domain (to this commentator over many decades) has for the most part been its emphasis on nothing more than light entertainment and fluff-Sachin Dev Burman transported the magic of his musical talents into a domain outside Bengal, and to his ultimate credit, maintained its intrinsic connection to its humble roots in the reeds and soil of Bengal’s rivers and hamlets. Sachin Dev Burman (1906-1975) was born to royal lineage on both sides of his family. His mother, Nirmala Devi, belonged to the royal family of Manipur, and his father, Nabadwipchandra Dev Burman, to the royal family of Tripura- both royal families in north-eastern India. This is also the very reason that he was also often referred to as Kumar Sachin Dev Burman (the sobriquet Kumar being an equivalent of Prince). As much as his musical legacy is intimately tied to the rural and riverine traditions of coastal Bengal, it is considerably noteworthy that his lineage points in the direction of royalty and affluence. There are echoes in this divergent floweringof the similar multidimensional artistic development of Rabindranath Tagore, who likewise was born and nurtured in an atmosphere of affluence. A particularly important point of oddity in this regard is the fact that even though Tagore’s overwhelming influence during his lifetime brought the vast majority of writers, musicians and artists into his orbit or in some manner into a mode of interaction with the defining genius of the age (whether cooperatively or in confrontation), Sachin Dev Burman, even as a musician with a rising reputation, had minimal, if any, interactions with, or even opinions on the Tagorean musical epoch. This absence of expected interactions would mystify many a cultural historian. In the remainder of this essay (divided into Parts I and II), I will present first an abridged explanation of the absence (perhaps even avoidance) of Tagore or his influence from SDB’s musical life. This will obviously be sketchy at best, since a musician with such lasting influence as SDB definitely deserves much more extended analysis and study in the domain of Indian folk music. I will then follow with brief snapshots (with interpretive summaries) of half a dozen or so of his representative Bengali songs to impart at least a flavor of his unique yet characteristically folk-inspired musical creations. RajyeshwarMitra(RM) in his informative biographic essay in the Bengali literary magazine Desh(Year 62, no. 5, 31 Dec 1998) provides a compelling portrayal of SDB in Agartala (capital of Tripura state). In the concluding portion of this essay, the author sheds much-needed light upon the Tagore-SDB relationship (or absence thereof). In essence, he describes the circumstances and contexts as follows. It is well known that Tagore had a very close relationship with the royal household of Tripura (one may mention that the family is fictionalized in several of Tagore’s writings- chief among these are his phenomenal plays Rajarshi (which also appeared as the play Bisarjan) and Mukut- MRC) from an early part of his life. It turns out that Tagore visited Tripura at least five times, yet Nabadwipchandra apparently never displayed any interest in the events surrounding the great poet. It is doubtful he even attended any of the receptions accorded to Tagore. One might surmise that one reason for this was the fact that Tagore was especially close to the potentate of Tripura, BirchandraManikya (1838-1896) and his successors. Birchandra was the younger brother of Nabadwipchandra’s father Ishanchandra (1829-1862), the ruler who preceded him. Birchandra ascended to the throne even though Nabadwipchandra, being the King’s son, was the natural heir (incidentally, Nabadwipchandra also had an older brother, about whom not much is mentioned, or is extant). Per RM’s analysis, the fact that Nabadwipchandra, despite being a deserving heir (and also highly regarded in Agartala) to his father’s kingdom, was nevertheless deprived of his ascension in favor of Birchandra, therefore was understandably deeply resentful of the whole matter. We note that Nabadwipchandra (1854-1931) was chronologically 7 years older than Tagore (1861-1941), and was only a minor in 1862 when his father died, and there was a risk of ceding the kingdom to the British Raj for this reason (as such, we find that this denial of succession to his father in turn removed Sachin Dev Burman from the rights of ascension as well). Nabadwipchandra at the time of his father’s passing was only 8 years old, and as mentioned was a minor. This would of course offer some justification for the departed ruler’s brother (who was then 24) taking over the reins of the kingdom. Moreover, there was another overwhelming factor which likely played into Birchandra’s decision. As alluded to earlier, in the mid-1800s, many regional dominions within India were being cleverly usurped or ceded to the British colonial masters (via Lord Dalhousie’s infamous Doctrine of Lapse) whenever there was a potential for lack of succession upon the passing of a ruler. One can readily understand if Birchandra may well have felt the impending risk of the Tripura principality ceding to the British crown via such a pretext. RM speculates that the grudge inherent in his being denied ascension may have contributed to Nabadwipchandra’s antipathy towards Rabindranath Tagore (who had over time become quite close to, and much admired by the Maharaja BirchandraManikya- the source of Nabadwipchandra’s disgruntlement). Since Tagore, through the patronage of Maharaja Birchandra, was reasonably familiar with the relationships within the royal family, it is very unlikely that he would not be aware of the unfavorable relationship between Birchandra and his nephew. Nevertheless, because of his admiration and affection for Birchandra he never made any reference to this matter publicly or in private. Nabadwipchandra, likewise, was noticeably silent about his uncle’s relationship with Tagore. RM surmises that it is likely because of this long-standing antipathy on the part of his father that Sachin Dev Burman as well never attempted to establish contact with or sought the blessings of the cultural icon of Bengal. It appears Rabindranath did make a reference to Nabadwipchandra and his sons in one of his letters to the poet Mohit Chandra Sen in 1904. In the letter, he indicated that Sachin Dev Burman’s two elder brothers might be sent to the school (later Santiniketan) in Bolpur. RM expresses doubt that this ever actually happened, or whether Nabadwip may ever have personally made such a proposition to Tagore. It is particularly interesting to note that Sachin Dev Barman’s father, the one-time heir-apparent to the Tripura throne (aforementioned Nabadwipchandra Dev Burman), was himself a noted sitar player and also (classical) thumrivocalist. Clearly, musical talent ran in the family- evidenced by Maharaja Birchandra’s renown as a flautist, and the royal family’s long-standing patronage of renowned musicians including Jadu Bhatta and Kasim Ali Khan in the 1880s. This tradition continued for many years after. Sachin Deb Burman’s abilities as a talented singer were evident from a young age. He grew up in Comilla (in today’s Bangladesh), and received early formal training from Krishna Chandra Dey, renowned devotional singer and uncle to the highly accomplished film and contemporary vocalist, Manna Dey. Additionally, he received further training early on from the accomplished classical vocalist Bhismadeva Chattopadhyay in the early 1930s, and also on the sarangi and the sitar from UstadBadal Khan and none other than the instrumental maestro, Baba Alauddin Khan (father of Ustad Ali Akbar and father-in-law of Pandit Ravi Shankar). RM’s essay throws a great bit more light on the musical evolution of SDB via Tripura (Agartala), Comilla, Calcutta, and eventually Bombay. As RM points out- SDB’s voice would not qualify for a tenor or a baritone; in fact, during my own younger years, I have witnessed ongoing snickers amongst my fellow listeners (and this went on for years) regarding SDB’s pronounced nasal tone. Yet to me, as with other things as well where I frequently tended to go against the grain, there was something absolutely special and uniquely gripping about SDB and his music. When I was less than ten years old (in the mid 1960s), a friend of the family whom my brother and I called BhattacharjeeKaku (he was my Father’s colleague SanjitBhattacharjee) sang a song on the harmonium at our home in Allahabad (far from Bengal) which was my first introduction to SDB. That song, O premjomunayehoytokeudheudilodheudilo re, was the first of SDB’s songs with the characteristic nasal tone- and even though many decades have passed since that moment- listening to BhattacharjeeKaku sing with nothing more than a harmonium this song of romantic love at a personal level struck me as something uniquely Bengali. From that day in the mid-1960s forward, I have listened to SDB’s songs in his own voice- having in the meantime relocated to Calcutta in 1968. Being in Calcutta (now Kolkata) meant being immersed in never-ending treasures of musical experiences, each segment of which could well form material for another essay. Suffice it to say that in the presence of such profound richness of musical creativity, I would personally never tire of listening to SDB songs and their connectedness to our Bengali roots, and that enjoyment and admiration continue to this day. RajyeshwarMitra, AgartalayeSachin Dev Burman, Desh, vol. 62, no.5, Dec 1994,  RamaprasadDatta, ed. and author, TripurayeShatabdirPrabandhacharcha, 1985. 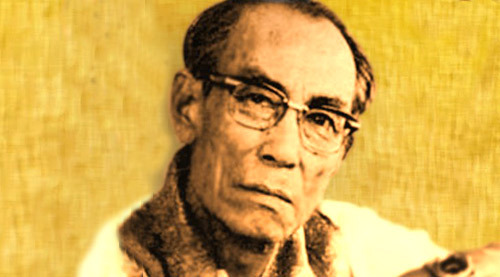 Burman da was a great composer. His combination with Sahir in films like Guru Duty ‘Pyasaa ‘ has earned great fame ..!